Sixteen-year-old Macy Queen is looking forward to a long, boring summer. Her boyfriend is going away. She’s stuck with a dull-as-dishwater job at the library. And she’ll spend all of her free time studying for the SATs or grieving silently with her mother over her father’s recent unexpected death. But everything changes when Macy is corralled into helping out at one of her mother’s open house events, and she meets the chaotic Wish Catering crew. Before long, Macy joins the Wish team. She loves everything about the work and the people. But the best thing about Wish is Wes—artistic, insightful, and understanding Wes—who gets Macy to look at life in a whole new way, and really start living it. I’ve been trying to think of the best way to review this book, because I feel like the first review I wrote for The Truth About Forever did not do it any justice. The thing is, I don’t know how to write a proper review for this book without squealing or “sa-woon”-ing so much. Because believe me, I know I did that so many times when I was rereading this book. But let me try again. 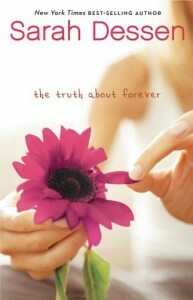 Sarah Dessen’s The Truth About Forever is one of my favorite books of all time. It’s not my first Dessen, but it’s the book that made me love Dessen and made her one of my auto-buy authors. It’s one book I’ve reread multiple times and still get all swoony and happy and wishing for a romance like Macy and Wes did. Yes, even with their drama, because it made the ending so much satisfying in the end. 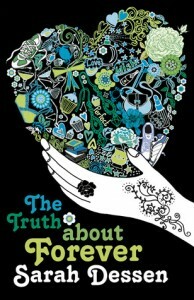 The Truth About Forever is about Macy Queen, whose life spun out of control when her dad died in front of her. Macy tried to hold it together for the sake of her family, hiding her grief and seeking perfection, thinking that this would help her mother who seeks perfection in everything she does as well, her own way of dealing with loss. The story starts with Macy’s boyfriend, Jason, leaving for Brain Camp and Macy facing a long summer with her strict schedule and routine. She’s okay, she always thought. Until one day, she meets the Wish Catering crew. One bad afternoon at her summer job, with a bad email to boot, she joins Wish, makes new friends, and meets Wes — the seemingly perfect guy with his own not-so-clean past, who likes flaws. Things turn interesting for Macy as she gets to know these people, and as she realizes that maybe it’s not so bad if her strictly-scheduled life unravels and she lets chaos in bit by bit. Ah, this book. I think what makes me love this book more than I loved This Lullaby is how much I could relate to Macy. I’m fortunate enough to have my parents here with me so I can’t relate to Macy at that front, but the schedules? The need to be as perfect as I can be (sometimes, anyway)? Oh, I’ve been there. At the next rereads, I found that I wanted to shake Macy so hard — she needs to cry! She needs to snap out of the illusion that she needs to be perfect to hold things together. She needs to let go and reach for her mom so they could grieve together! Ah Macy, why do you frustrate me so much? There’s really nothing new with the story, but thanks to the writing and the vivid characters, it becomes a little bit extraordinary. This book is one of the reasons I appreciate characters more, why I believe that even the most common storyline can be interesting when the roles are played by strong, well-developed characters. And then there’s Wes. Dessen boys are well known among readers, and Wes is definitely my favorite. He just seems so…perfect. Strange to see a seemingly perfect guy in a book that tells the main character that perfection isn’t everything, don’t you think? Believe me, I’m still trying to find some kind of flaw in Wes. But I guess that’s what crushes are — it’s so hard to find a flaw in them. I think I’m not that infatuated with Wes that I’d try and look for someone exactly like him (but hey, I wouldn’t mind, haha), but I would like to have the same kind of development that Macy and Wes had. Their relationship is one of the most authentic ones I’ve read — built on shared experiences and conversations. Now where is that guy I could play a game of Truth with?